A small team of researchers from the U.S., Australia and Germany has found evidence that suggests cloud formation may have a much bigger impact on weather patterns associated with El Niño events than has been thought. In their paper published in the journal Nature Geoscience, the team describes they differences they found when they input cloud data into computer models that simulated weather patterns associated with El Niño events and why they now believe that all such models should include such data going forward. Scientists predicted that El Niño weather events would be more severe this winter compared to recent events, and thus far, their predictions have proved to be true—temperatures have fluctuated wildly in parts of Europe and the U.S. along with associated rain events, leading to serious flooding. In this new effort, the researchers have found that cloud formation may have more influence on such weather events than has been thought. The El Niño/Southern Oscillation (ENSO) as it is known formally, causes the most weather variability on a small time scale, and attracts an enormous amount of attention due to associated changes in rain patterns—the western parts of the U.S. and the northern parts of South America, for example, typically see more than normal amounts of rainfall, while parts of Africa experience droughts. As scientists struggle to truly understand global weather patterns associated with ENSO, they debate the degree of impact of oceanic processes versus those that occur in the atmosphere. In this new effort, the researchers suggest that the atmosphere may exert much more of an impact on ENSO events than has been thought, due in large part, to cloud formations which can serve as a blanket of sorts, preventing warm air from escaping from lower elevations, which can lead to more rainfall. To better understand the impact of cloud formations on ENSO weather events, the researchers input cloud data into standard climate models and compared the results with models running under the same conditions without cloud data. They report that they were surprised to find that the cloud formation data caused large changes to atmospheric circulation patterns and accounted for more than half of the strength of ENSO events. They suggest their findings indicate that all future climate models include cloud data so that they can offer a better representation of real events, and thus, give better predictions. These are the misleading models many politicians seem happy to rely on as the ‘beyond dispute’ truth, even though they can’t predict the present. Scientists who believe that they can omit the effects of clouds from their Climate Models, can never have been outside on a warm day when there were scattered clouds in the sky. The effect of the clouds on the temperature is blindingly obvious even to a non-scientist. Present models give no worthwhile predictions and work should start now on models that do give worthwhile predictions using the Sun and Clouds. The ‘cloud problem’ itself was known, but not what the results of a new approach might be. ‘Traditional global climate models have avoided directly simulating the role that clouds play in Earth’s climate systems. The nebulous billows of water droplets are generally too dynamic and small for classic models to resolve. Instead, these models have relied on numerical simplifications called parameterizations to stand in for the clouds’ aggregate effect. Bruckner8, as an honest reply I’ll say that they always knew clouds had a big effect but most decided to ignore the elephant in the room and work on something easier instead. But climate science is not the only discipline to operate in this manner. Computational protein-folding chemists know that there is a conundrum that lies at the heart of their research: To computationally explore all the theoretical (thermodynamic) folded states of even a small protein would take the largest computers longer than the time remaining in the Universe before the big-crunch. So they, quite reasonably, take the approach “Can I do something useful in the meantime?”. And they have done some useful things. Where the climate-scientists and the protein-folders diverge, is that the protein folders don’t try to argue that their research requires that the entire world must reject capitalism and the very real benefits accrued to the human race in the 200+ years since the industrial revolution raised us up from grubbing an existence out of the mud. I would argue that they mix cause and effect. As I have found, the ENSO phenomenon is driven ultimately by external forcing factors which act mechanically on sea current mixing by forces that are way outside of internal weather dynamics. Svensmark’s theory may work, but are far too weak to have any effect on individual ENSO events. Of course cloud cover is important. But it is not an ultimate cause or effect but an intermediate variable. So it must occur on both sides of equations somewhere. Sun, temperature etc affects cloud cover. Cloud cover affects temperature etc. I’m with Per Stranberg on this, at least in terms of his comment though I have not as yet visited his site for the background to his assertion. As I see it, the velocity of the westerlies and the trades varies with the flux in surface pressure between high and other latitudes. When atmospheric mass moves from latitudes higher than 50° of latitude it accrues in latitudes lower than 50° of latitude adding to surface pressure where the trades and the westerlies originate enhancing the circulation of the oceans and driving cold waters into the tropics. Increased surface pressure and geopotential height in the mid latitudes is associated with the disappearance of cloud and surface warming. In the tropics clouds move west with the warm water pool. La Nina is associated with an enhanced flow of energy into the global oceans. The tropics cool as the mid latitudes warm. After the cooling, it is discovered that temperatures have risen to a new base state. The process is reversible when atmospheric mass returns to high latitudes.That depends upon the interaction of the mesosphere and the stratosphere at the poles in winter. More NOx leads to less O3 and in turn rising surface pressure in high latitudes. The number of neutrons in Oulu has exceeded 6400. High pressure over the Greenland. It will be cold in Europe. The IPCC makes it very clear they are NOT looking for the factors that affect the climate. They are only looking at CO2. So it never was about understanding the climate. It was really about ‘options for mitigation and adaptation. ‘ and this is the change wanted by the Globalists like the UN, the World Bank, and the WTO. So not only has the IPCC and the climate modelers ignored clouds, they have also ignored the sun. That paper Recent variability of the solar spectral irradiance and its impact on climate modelling has some other interesting points. Since it is 33 pages long I will cut and paste parts of the paper. It has the usual kowtows to the CAGW Priestly Gatekeepers but it collaborates several of the points we have been trying to make. The first point is that the IPCC and the ClimAstrologists in general have ignored anything but the CO2 effect on the climate. The conclusion of the paper makes it clear the sun has been ignored. A unique aspect of this study is the description of the solar terrestrial connection by an interdisciplinary team of solar and atmospheric physicists. Progress on this hotly debated issue has often been hampered by the fact that limitations on observations or on models are not always properly known outside of a given scientific community. For the first time, a comprehensive comparison and discussion of all relevant SSI measurements and models available for climate studies is presented, as well as a first investigation of their impacts on Earth’s climate within a number of different CCMs. These results highlight the importance of taking into account in future climate studies SSI variations and their effects on the Earth’s atmosphere…..
….we focussed on the effect of the solar forcing without quantifying the impacts on amplification and feedback mechanisms. This should be done in a coordinated set of CCM experiments where the treatment of SSI inputs to the models are completely specified and results are robustly comparable with each other. Then, it will be also possible to investigate the effects of the top–down feedback and for CCMs with an interactive ocean also the bottom–up feedback mechanism…. WTF! The IPCC and Hansen and everyone else has been screaming ‘The science is settled!’ and they haven’t even bothered to look at the effects of the sun on the climate??? Not only that taxpayers are on the hook for trillions of dollars for ‘Global Warming’ and yet they can’t site, calibrate and maintain the temperature measuring devices nor can they do decent long term measurements on the factor most likely to be the REAL control knob the variable sun. —– …with the full operation of the SORCE mission in April 2004, daily observations of the full UV, visible and NIR spectrum became available. Unfortunately, this situation is likely to end in 2013, when SORCE is anticipated to succumb to battery failure. The lack of SSI observations has led to intensive application of semi-empirical models. There remains a considerable issue in assimilating SSI observations in such models and in reconstructing the SSI prior to the space age…..
—– Results obtained with CCMs show that the observed increase in UV irradiance at solar activity maximum compared to minimum leads to an increase in atmospheric heating rates and, correspondingly, an increase in stratospheric temperatures. This direct atmospheric response is larger for larger UV forcing, i.e. for SORCE as compared to NRLSSI, and is sensitive to resolution in the radiation code. Currently there is insufficient observational evidence to support recent SSI measurements by SORCE on the basis of comparisons between climate model simulations and atmospheric ozone or temperature observations in the stratosphere. The larger UV forcing also leads to a larger surface response…. —– Accurate representation of the spectral nature of the incoming radiation, especially at wavelengths below 320 nm, and therefore ozone photochemical variations in the model simulations, is important since these changes amplify the atmospheric solar signal. A more accurate representation of the Chappuis absorption band in a radiation scheme revealed enhanced sensitivity in the heating rate response, which again highlighted the importance of a well resolved radiation code. Now into the nitty gritty of the paper. Do not forget the SORCE/SIM data is for the last part of cycle 23 and the 2008-2009 Deep Solar Minimum NASA talks about. Early satellite measurements of the solar UV variability have shown a qualitatively consistent behaviour… The SORCE/SIM data showed a 4–6 times greater decrease of the UV radiation between 200 and 400 nm over the period 2004–2008…This larger decrease measured in the UV (Fig. 2), which exceeds the TSI decrease over the same period by almost a factor of two, is compensated by an increase in the visible and NIR bands. Variability out-of-phase with solar activity is indeed predicted by some SSI models in the NIR, but with a significantly lower magnitude than found by SORCE/SIM… The inverse variability observed by SIM in a wide integrated band in the visible was, however, unexpected…. TSI is the spectral integral of SSI over all wavelengths but its weak variability masks the fact that relative SSI variations show a strong wavelength dependence (Fig. 1). In particular, the visible and NIR bands are the least variable of the solar spectrum with a relative solar cycle amplitude of the same order as for the TSI (0.1 %), whereas values of 1 to 100 % are observed in the UV variations, and in excess of 100 % in the soft X-ray range (below 10 nm). Each individual spectral band has a markedly different impact on the terrestrial atmosphere, which depends on the atmospheric processes affected by the given band, the amount of the spectral flux, and its variation…. Harder et al. (2009) presented multi-year SORCE/SIM trends indicating that UV variability during the declining phase of solar cycle 23 (between 2004 and 2008) was larger than that observed in previous cycles, and was compensated by trends in other bands in the visible and NIR that increased with decreasing solar activity. SORCE/SOLSTICE has also shown enhanced UV variability for the same time period. Solar UV variability measured by both SORCE/SIM and SORCE/SOLSTICE exceed the variability observed by UARS/SOLSTICE and UARS/SUSIM over solar cycle 22 and ascending phase of cycle 23 by a factor of 3–10 depending on wavelength (DeLand and Cebula, 2012; Figs. 2, 4, and 8)…. Finally, they are starting to see the impact and importance of clouds for ENSO! We (Nikolov & Zeller) have been pointing to the role of clouds since 2012. All cyclic variations of global climate (temperature) operating on a time scale of years to centuries (such as ENSO, PDO, AMO etc.) 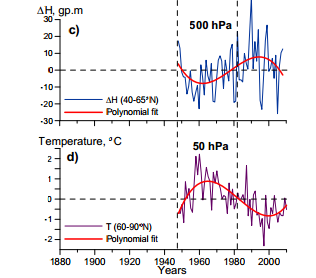 are caused by fluctuations in cloud formation, which in turn are driven by variations in solar magnetic activity… The entire observed warming from 1650 to the present was due to a reduction of about 1.2% in Earth’s cloud albedo as a result of increasing solar activity… Climate funding needs to be directed towards researching the mechanisms by which the Sun influences Earth’s cloud albedo, for it is the true driver of Earth’s climate on a human time scale! I agree that it’s the variations in solar magnetic activity that result in cloud cover variation but I am extremely curious as to how you can be sure that this is in fact the case and the nature of the links that you envisage connect solar magnetic activity and cloud cover. Perhaps I am not reading widely enough. It’s one thing to know these things and another thing entirely to begin to influence people in the hope of swaying public policy away from the disastrous course that has been set. Finding out is a worthy activity but the next steps are possibly harder to accomplish requiring a different set of skills entirely. A lower solar activity this high pressure in winter over the polar circle and lows in the mid latitudes. This increases the albedo. Growth GCR increases the amount of condensed water in clouds and increase the albedo (by an increase in ionization of air). Let’s see how increase in cloud cover affects the temperature of the sea. Ren, A marked increase in surface pressure over the Antarctic (fall in the AAO Index) starts 1st January. In my understanding that increased surface pressure, were it to occur between March and November would result in a marked increase in the flow of mesospheric air into the Antarctic stratosphere, but in December through to end of February is of less account, perhaps more so south of 30° south latitude. Heating of the atmosphere over Antarctica reverses the stratospheric flow resulting in gentle uplift over Antarctica during that time interval. That said, there has indeed been a fall in the temperature of the Antarctic stratosphere below the 10 hPa pressure level in the last three days. In the mid latitudes this could mean a fall in surface pressure, an anomalous decrease in geopotential height, cooling of the atmospheric column, more cloud and surface cooling but its not the right time of the year to produce a big effect. There is a related warming of the Arctic stratosphere going on at the moment that will be more influential in reducing cloud cover over all latitudes north of 30° south. The pressure over the eastern Antarctic land is a separate issue. Sorry, somehow I misread the title to the AO diagram and responded as if it related to the AOI. Yes, pressure rose in the Arctic (as shown by a fall in the AO index) and currently there is anomalously high pressure over Grrenland/Hudsons Bay and also East Asia. So, there is lots of cold air streaming south with China apparently experiencing the coldest winter in 30 years. 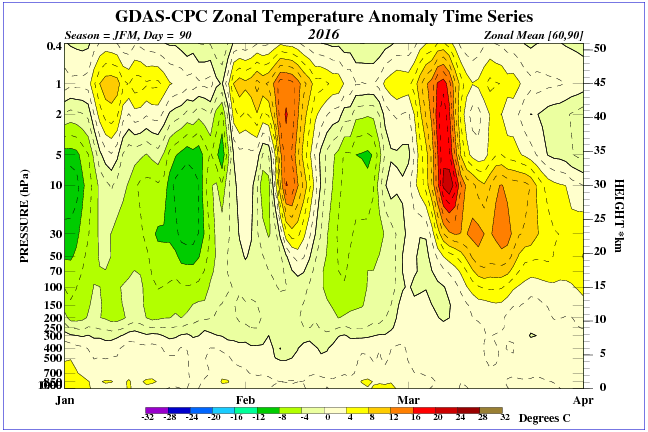 We have a minor warming in the upper stratosphere starting about the 6th January. What are you saying in this sentence: ‘A lower solar activity this high pressure in winter over the polar circle and lows in the mid latitudes’. I don’t understand. Pressure moves inversely between the Arctic and the mid latitudes….if that is what you are saying I agree. Can you see the concurrent increase in cloud cover over the sea? It shows the density of the solar wind. Changes in the density of the solar wind on the pole cause waves in the upper atmosphere and affect the change in pressure in the lower layers. Ren, I have read the thread. It seems that we agree that ozone is the driver of the jet stream. I see it also as the driver of 500 hPa geopotential height that relates to surface weather….If height increases it is related to atmospheric heating, loss of cloud cover and the surface warms.At the same time increased geopotential height is related to increased surface pressure so the winds change and this in itself will cause a temperature change. Its cold polar easterlies versus warm moist westerlies. I see ozone also as the driver of the movements of the atmosphere above 200 hPa through to 10 hPa as we see on the null school site. This is related to ozone’s nature as a greenhouse gas absorbing infra-red from the Earth itself. But on the drivers of the ozone content of the winter high latitude atmosphere we differ. I see it as very much dependent on the flow of mesospheric air inside the vortex that I can demonstrate depends simply upon surface pressure. Surface pressure in turn depends upon the solar wind. If you google ‘solar wind surface pressure’ there is a lot of literature on the subject. Once initiated a change in surface pressure is greatly amplified by the working of the polar atmosphere. This is the chain of causation as I see it. 1 increased geomagnetic activity= movement of atmospheric mass from the high latitudes of the winter hemisphere to mid and low latitudes and across into the summer hemisphere. 2 lower surface pressure moves the winter vortex towards the summer mode when it loses activity so decreased flow of mesospheric air via the vortex. 3. Mesospheric air is constantly escaping from the vortex into the wider atmosphere eroding ozone. If the flow is reduced ozone partial pressure increases driving surface pressure lower via the intensification of polar cyclone activity. This sets up a vicious circle of pressure reduction that is however limited by gravity and ultimately shut down by the return of summer and the annual minimum of surface pressure at the pole….cutting off the flow of mesospheric air into the vortex. Looking at the thread there is a lot of comment on the paper that Tallbloke put forward. There is a fundamental error in the paper and that is the failure to recognize that outgoing radiation rather than incoming short wave is responsible for the temperature of the stratosphere. 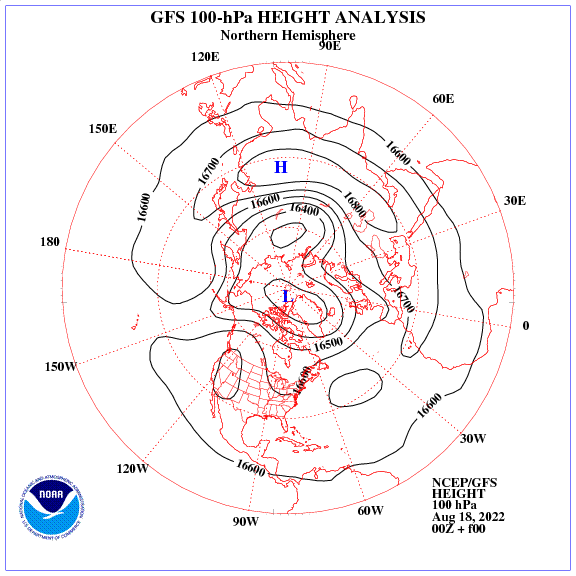 Above 10hPa yes, below no and near the poles in winter definitely no. Another error is the notion of a ‘pause’ that represents a thickening ‘tropopause’ as latitude increases. This is a conceptual error related to a notion that the stratosphere must be a quiescent, non convective medium and a failure to observe that it is the descent of ozone, ever lower into the atmosphere, in winter, as one moves into higher latitude that warms the air. It is the presence of ozone that determines the lapse rate…not because it absorbs UV but because it absorbs infrared at 10um. Erl: there is a lot of comment on the paper that Tallbloke put forward. Hi Erl, this article was posted by my co-blogger Stuart ‘Oldbrew’. I haven’t read the paper. Considering that the poles in winter get little sunlight, I’d agree the atmospheric temperature profile there is determined by the Earth’s processes, not the Sun. One aspect of your analysis has me puzzled though. You say the polar air is warmed by descending ozone, but why does it descend? Molecular weight of O3 vs O2 and N2? Does that overcome the buoyancy due to its higher temperature? 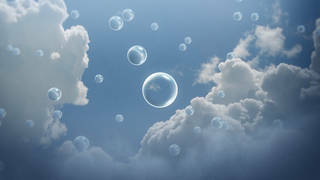 Air warmed by ozone ascends because its less dense. It is responsible for polar cyclones. The effect of the circulation aloft is to draw in air from beneath all the way to to the surface. Its air of mesospheric origin that descends and that air is relatively ozone deficient, hence cold and more dense. Gets down to about 200hPa where marked differences in density drive the jet stream. Not only is it enhanced in concentration in the usual places but it is more present in the lower part of the atmospheric column that is usually described as ‘troposphere’ that lies under the ‘tropopause’. But. the notion of a tropopause makes no sense in high latitudes. 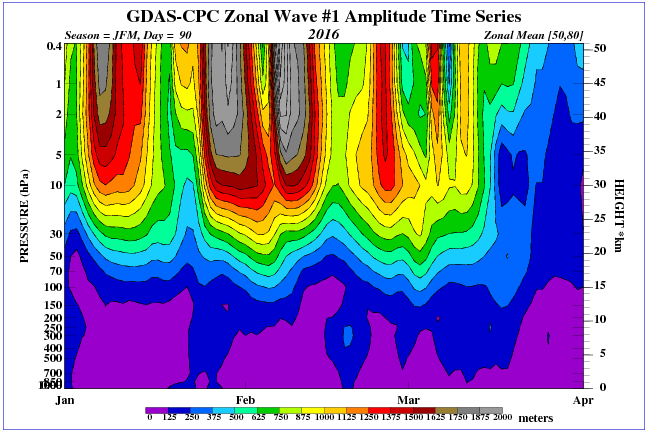 Ozone affects the lapse rate above and below 500 hPa at 60-70° south and to the surface at 70-90° south. In these latitudes the entire column is ozonosphere. 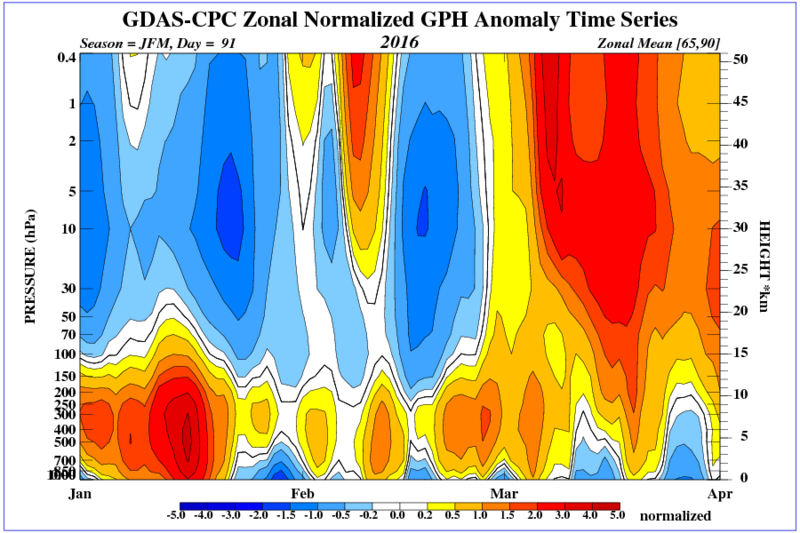 Its anything but stratified.In fact the jet stream lies in the ozonosphere. So, it doesn’t have the character of a ‘stratosphere’ and we shouldn’t call it that. In fact if you look at the circulation of the winds at 50 hPa and 10 hPa at:http://earth.nullschool.net/ you will find that the stratosphere turns over like the troposphere and its circulation is linked to that in the troposphere in both high and mid latitudes. There are fundamental differences between the high latitude atmospheres in the two hemispheres that make it it impossible to generalise. What applies in the Antarctic does not necessarily apply in the Arctic but the modes of variation are exactly the same. Hi Tallbloke. I have just posted at https://reality348.wordpress.com/2016/01/15/8-volatility-in-temperature/ an article that can stand alone as a discussion of the origins of surface temperature change. Its a game changer and if you could make people aware of its existence I would be much obliged. It establishes that surface temperature variability is linked to polar atmospheric processes and explains the how of it. Hi Erl, I fixed the link in your last comment for you. Please enable reblogging in your wordpress control panel so I can use that facility to encourage people to visit your site by republishing intros here. You need to learn how to use the ‘more’ tag in your post editing (it defines the length of the intro so the entire article doesn’t appear on the front page of your site, which now takes a long time to load, due to the big images and two column style). Not sure which of your articles you’re trying to link to in your previous comment, but it looks like you’re copying a link which is for the site admin only, so I can’t navigate to it. Just go to the article and copy the address out of the browser URL bar at the top. Erl allow me to limit myself to the impact of solar activity. Look at the GCR increase in January. Erl see where there is the strongest activity GCR. This is the lower stratosphere. What do you suppose that cosmic ray activity is responsible for? Does it promote the establishment of strong magnetic fields and the movement of neutrals along with particles carrying an electric charge along field lines either to or from the poles? Is it responsible for some of the movement of atmospheric mass across the 50° latitude line? Reporting in the journal Geophysical Research Letters, Osprey et al. compare cosmic ray muon rates from the Main Injector Neutrino Oscillation Search (MINOS) underground neutrino detector in Soudan, Minnesota, with upper air temperature data from the European Centre for Medium Range Weather Forecasts during the winters from 2003 to 2007. They find a strong positive correlation between muon rate and temperature. So, Muon rate is a proxy for stratospheric warmings in the polar atmosphere that are most prominent above 30km. Cosmic rays are most present according to your graph at 17km in elevation where the warming is relatively slight. Cosmic rays are not responsible for stratospheric warmings. 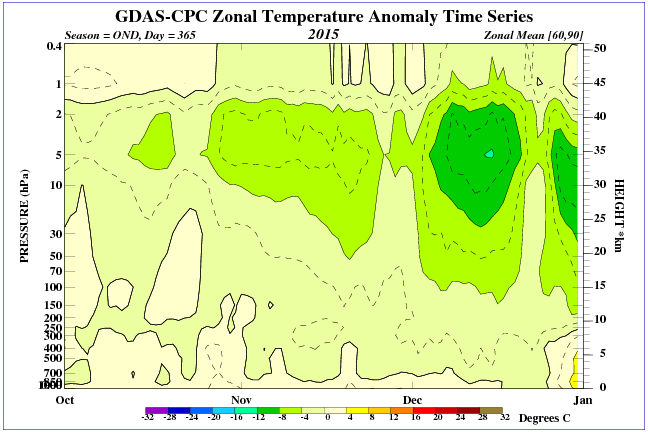 A stratospheric warming is the result of a temporary exclusion of a tongue of very cold mesosphere air over the pole. But the presence of a stratospheric warming so changes the atmosphere that it allows a temporary increase in the penetration of muons and that can be measured deep in the Earth. This is correct. But the authors do not understand why this is the case. The ozone content (and temperature) of the polar stratosphere (and the state of the vortex) is a function of the rate of flow of mesospheric air into the stratosphere via the vortex which represents a tongue of mesospheric air that is present in the winter. Two things happen to promote the presence of this tongue of mesospheric air. 1 high surface pressure due to mass transfer from the summer hemisphere. 2 enhanced ozone partial pressure in winter setting up a cone of low density air at 50-70° of latitude comprising a chain of polar cyclones that is rapidly elevated. By mass transfer the air has to descend somewhere to balance that ascent. Most descent is in the mid altitudes but there is also some over the poles. The descent over the poles brings in mesospheric air. The solar effect is via electromagnetic causation. This shifts mass across the 50° latitude band and sets the atmosphere up for a strong reinforcement of the slight initial movement. Erl pay attention to the magnetic field. Annual rate of change of declination for 2015.0 to 2020.0 from the World Magnetic Model (WMM2015). Red –easterly change, blue – westerly change, green – zero change. Contour interval is 2’/year (1/30th of a degree), white star is location of a magnetic pole and projection is Mercator. Primary cosmic rays are protons. The neutrons are small magnets, and ozone diamagnetic. That ozone is diamagnetic, and given its distribution in the winter atmosphere, may be sufficient to give rise to a shift in the entire atmosphere as the solar wind impacts the Earth’s magnetic field. It does not need to be a strong effect, just episodically renewed, and it has to be from high latitudes towards the equator. Then the polar atmosphere applies a reinforcing change in the same direction. 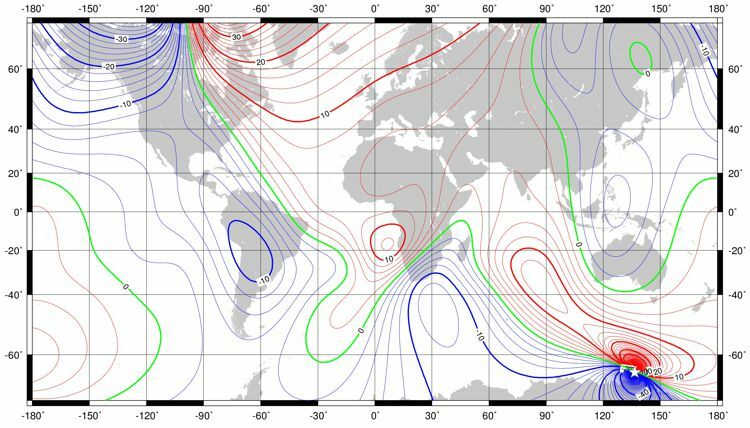 The change in the Earth’s magnetic field over time would then directly impact the climate system via the distribution of high and low pressure cells. Could mirrors and steam be a cheaper energy source than nuclear?